There are some serious escape artists out there. I’m talking about dogs escaping from crates. You love your dog, and the battle of the crate can seem arduous at times. Yet, it’s a necessary tool for training your dog to get accustomed to routine and housebreaking. There are numerous crates on the market that target frustrated dog owners dealing with a Houdini hound. From materials to construction and size, multiple unique features aim to put an end to escapes. But, it can be overwhelming to navigate through products. Especially since heavy duty crates cost hundreds of dollars. You don’t want to make the wrong choice! Lucky for you, we’ve done the dirty work, so you can have some peace of mind. How do Dogs Escape from Wire Crates? Do You Have an Escape Artist on Your Hands? Which tactic will you use to prevent a great escape? A wire crate might seem pretty straightforward. A metal box with bars and a lock is something no one will mess with, right? WRONG. A dog that is anxious for freedom has plenty of time on their paws to figure out how to escape from a crate. The list of tactics undertaken by dogs to finagle their way out is limitless. But alas, here are 3 of the most common ways they have been known to make moves. Also note the weak spots on crates that should be considered when you purchase one, such as metal connectors on the corners. Your dog will practice toggling the latch until she pops it open. Then, you’ll be amazed when she slowly perfects her newfound talent, getting slicker and faster at opening the crate door without any chewing or busting. Heavy duty crates do not feature the typical wire latch design that slides through a holding piece to lock. Instead, most will feature 2 small steel latches as opposed to one for extra security and safety. Wire cages utilize thin metal connectors that hold the crate sides and door together. Houdini dogs simply gnaw at these weak spots until the crate sides give or the door pops off clean. A heavy duty crate will feature a thick steel frame and bars that are reinforced by steel screws instead of connectors. This is handy because dogs are unable to grasp onto any pieces that stick out that allows them to hold and chew connectors. These dogs don’t have time to waste. They use sheer muscle power to bust through a weak spot in a wire crate. Crates can be dangerous though. As you can see in the video, the dog momentarily gets caught on the crate by the collar. He manages to wriggle free, but in other cases, this has been known to cause strangulation. 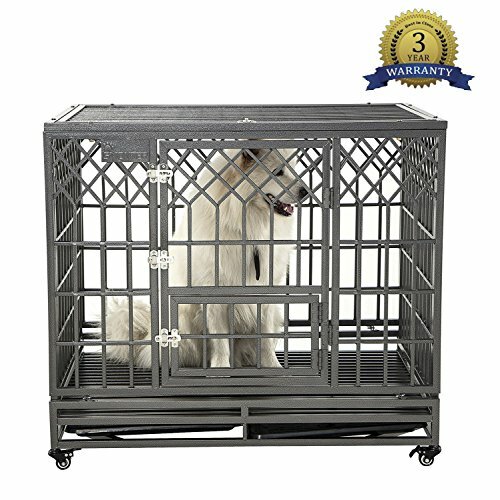 The solid steel frame of the heavy duty crate stops dogs from being able to bend the bars or shove their heads under corners where there is space to work with. Never forget that when your dog is in her crate, she has nothing but time to figure out a way out of there. Some dogs so suave at maneuvering that hundreds of dollars, multiple crates and destroyed belongings later you’ll be desperate and wondering if there is nothing you can do to incarcerate her. Think of it this way; dogs take the time and patience to find creative solutions for escape. Instead of only relying on a crate’s durability to thwart your dog’s efforts, taking time to learn your dog’s behavior can help you discover new, ingenious solutions to put a stop to her busts. Here are some different methods you can use to try to understand why your dog is breaking out, how she does it and what you can do to stop it. Most doggos will wait until the owner is out of the room before they try any sneaky business. You can either hide out of sight or set up a webcam to monitor how exactly your dog escapes. By learning her tactics and the weak spots she exploits, you can focus your reinforcement efforts on these specific areas. 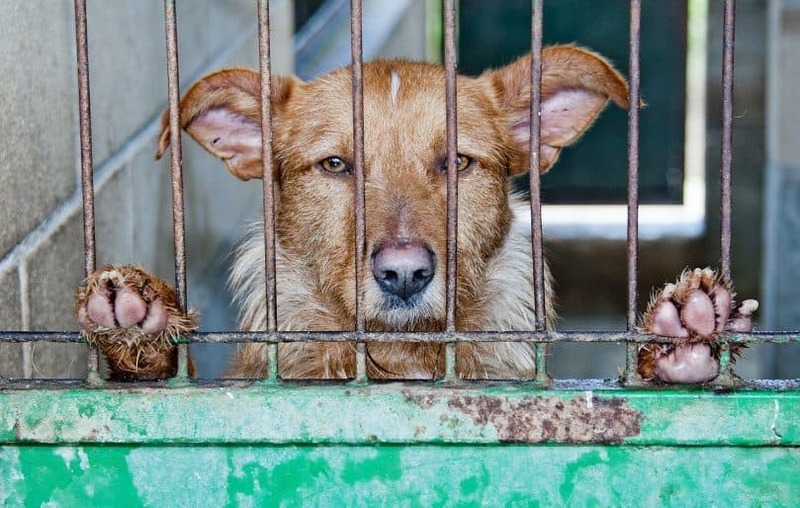 Imagine if you were left in an empty crate for hours. You might be the type that will take the opportunity to snooze or you’re the restless type that can’t sit still. Dogs are the same! They need something to keep them entertained, and a favorite toy could be the trick. Cover the floor of the crate with a soft blanket that has your dog’s scent on it to help foster a den-like atmosphere. Leave your dog’s toy inside before you go. Make sure it is safe, as in it doesn’t have loose fabric ends or long pieces of rope that could potentially get snagged on the crate. Crate placement is extremely important. Not only can the right spot hamper escape attempts, but it prioritizes safety as well. Placing the crate by a window gives your dog a view of the yard and road, which can keep her attention quelled. On the contrary, if your dog gets over-excited at the sight of squirrels, then this type of placement might backfire on ya. A quiet corner of the house can help easily stimulated dogs relax. Avoid placing a crate near curtains or furniture, especially if doggo likes to indulge in destructive chewing. This is for safety also. You don’t want any loose fabrics nearby that could potentially wrap around your dog’s neck. For more ideas on crate placement and what to put inside the crate, click here. Before crate time, take your dog out to burn that extra energy. Try a long walk, jog in the park or play fetch with a ball in the backyard. By giving her outside time where she can be active and incorporating crate-friendly games, your dog will be tuckered out and ready to rest in a safe space- her crate! If you’ve observed your dog chewing at the connectors, get the toolbox out and reinforce them with metal carabiners. 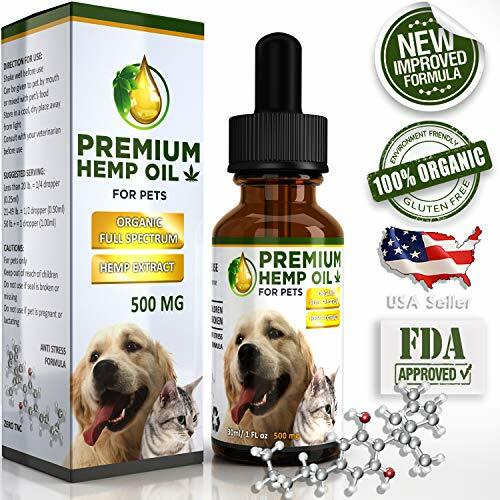 This assures extra strength and safety for your dog. For example, never use duct tape or zip ties for a quick fix. Not only can these methods cause harm but they’ll be torn through in no time. When you’re dealing with an escape artist pooch, we know you get plenty of experience with crates on the battlefield. Many dog owners dealing with crate training have most likely poured over online reviews, talked to professionals and spent countless dollars on crates that they fervently hoped would be the one to do the job. Regardless, crate training a dog can be arduous, especially if she suffers from severe separation anxiety or other emotional issues. It’s not anyone’s fault, least her’s, but it’s a great responsibility that a fur parent must undertake. We took the leap into the world of heavy-duty crates ourselves to find the creme de la creme, as we know how expensive and time consuming it can be. As dog owners ourselves, we understand that no two dogs are alike and each has its own quirks and needs. Also, no dog crate is 100% inescapable and we doubt you’ll find a designer out there that guarantees that. Dogs are intelligent, zany and never fail to impress us with some sort of trick they’ve got up their fur-coat sleeve. But, that’s also why we love them! After conducting our research, we believe that when searching for a hardy crate, these are the top features to look for when it comes to design and materials used. Heavy-duty crates built from metal, especially steel or aluminum seems to be the strongest material. The structure and bars should be thick so they cannot be chewed. Solid bars that are evenly spaced allow petting along the sides and then tight bars on the bottom allow the dog to move comfortably. It also holds bedding without it falling through wide gaps. Many crates make clean-up easier with a removable metal pan that slides securely underneath the floor, so dogs cannot reach them. Pay attention to the materials, shape, and placement of the latches. They should be compact and made of metal that lock firmly into place instead of sliding. Some crates feature two latches at the top and bottom of the door. Look for a crate with a door on the side for doggo’s entry and then a door on the top so you can easily put food or water inside without having to hold a rambunctious pup back. Portability is important for convenient crate placement. Always test the wheels to ensure they roll properly and don’t leave any black streaks across your clean floor. 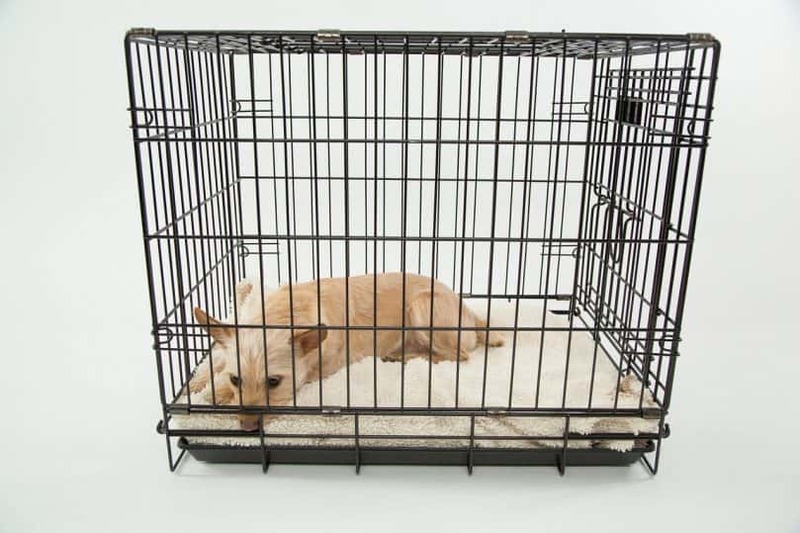 Choosing the right size crate is important because you want your dog to feel safe and secure. A small dog in a large crate might turn a roomy corner into a personal toilet. Without further ado, BEHOLD the kings of the crate! 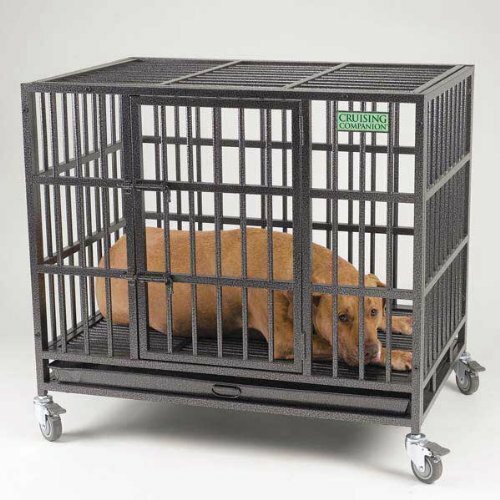 This heavy duty crate is made from commercial-quality steel featuring a 3/4″ frame reinforced with 1/2″ diameter (20 gauge). The steel bars are welded. Comes with 4 wheels that lock into place when needed. Features a 2-door design; one on the front and one on the top of the crate. The front door features 2 latches that lock into place. Comes with a removable pan for cleaning. This model is rust and corrosion resistant. Upon first glance, this crate looks like it could hold a gorilla. Indeed, it checks the box for steel sturdiness and a thick frame. The latches are a bit weak though, which is all a Houdini dog needs to get to work loosening a latch. We found that reinforcing them with something sturdy like a luggage lock adds extra security. You can even try applying hot sauce to spice things up for your dog! Overall, the price of this crate is very reasonable compared to other heavy-duty crates that offer similar features but cost double. This is a 20 gauge steel cage reinforced with 0.5-inch diameter steel tubes. Comes with a metal pan that slides underneath the floor of the crate. Features rolling wheels that can be locked into place and also detached. Has one door on the front with double latches that slide to lock. This crate ranks high with us, simply because it gets the job done. The frame and materials are top-quality, thwarting chewing or breaking. The metal pan fits neatly underneath and allows for easy cleanup. The rough, grated floor can be obnoxious to clean as opposed to a smooth one. One con was a broken wheel castor, which didn’t affect the crate’s ability to detain a dog, but did make portability a bit of a pain. 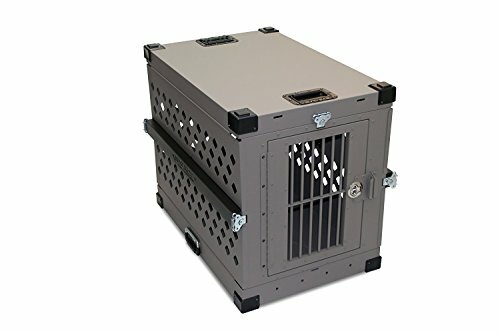 Overall, this heavy duty crate ranks high as being able to stop escapees, although, for the small weaknesses that can occur, the price is quite high. Constructed with welded, diamond tread aluminum. Comes with a carrying handle on the top of the crate. Corrugated plastic insulation is used on the exterior and interior walls. Forget metal bars! 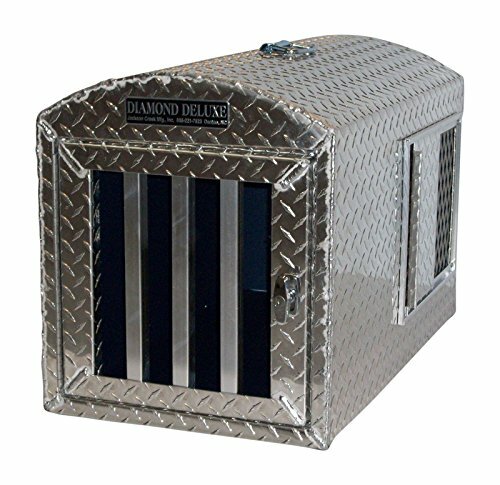 This heavy duty crate comes in a solid walled box that is welded together at the edges. The door features three thick bars and a latch that locks with a key and is placed on a well-covered area on the front that cannot be reached by teeth. The lack of bars, configurements and spaces make it difficult for dogs to find weak spots and get loose. The chief complaint is that the dogs can easily turn to destroy the plastic insulation that covers the interior roof and floor. The other complaint has to do with the absence of a removable cleaning pan. If a dog makes a mess, there is nothing to “catch” it. A yucky situation not only spreads through the crate and gets stuck in the corners, but makes it more of a hassle to clean. Overall, this crate is expensive, especially considering that other crates priced around the same offer easy cleaning pans and portable wheels, which this crate lacks. Designed from lightweight aircraft grade aluminum- durable yet light to handle. Features a lockable slam latch, where the door comes with a flush mounted slam latch and key. It’s manufactured from stainless steel for durability and to prevent corrosion. If you really want to go all out on a heavy duty crate, then try this model. 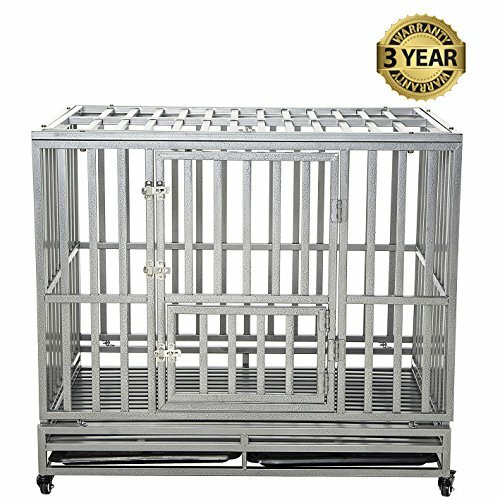 The durable aluminum finish and enclosed box shape with minimal bar construction are sturdy for detaining even the most determined dogs. Since the building materials are lightweight, it’s easy to move around. Keep in mind that there are no wheels included or a removable cleaning pan underneath. Because of the quality of the materials and the ventilated design, this crate is one of the more expensive buys, but it does what it’s supposed to- stops escapes! American-made aluminum crate featuring a powder coat finish. Easy setup and take down, with the ability to collapse to around 8” tall. Includes a handle for carrying. We felt confident with the lightweight, durable construction of this aluminum crate. The latch is strong and with the lack of bars, reduces the space dogs utilize to chew and grab onto locks with persistent teeth. Another plus is that the lightness of aluminum allows for better airflow and less heat retention. This, along with the fact that it’s collapsible, makes this heavy-duty crate reliable for travel. It’s also IATA approved. This crate doesn’t come with a removable pan or wheels, which can be a hindrance if you like to push it around the house or if your dog has accidents. Still, it is convenient to move with quick collapsibility and is geared towards travel, especially on planes. Most importantly, it does a fine job of keeping Fido contained. The frame is thick and made from steel. Comes with 4 attachable wheels that can rotate 360 degrees and lock into place. Features a 3 door design. There are 2 plastic trays for easy cleaning. They thought of everything when the makers designed this heavy duty crate, and in our book, it holds up against the greatest of doggie escape artists. Some of the more unique features include 3 doors- front, top and back- that allows for easy feeding. Also, there are not 1 or 2, but 3 lock latches securely fastened to the front door to dissuade latch masters. For easy cleaning, there are 2 plastic pans snugly situated underneath the crate to catch any mess. Roller wheels attach to the bottom corners and can lock into place as well. It’s a roomy crate. We love this one especially for large dogs that need something durable with enough space to move around comfortably. The price is amazingly on the lower side for all of the features it comes with. The only “meh” we had for this one concerned the bars on the floor being uncomfortable for a dog to lay on, which can be adjusted by adding a flat and smooth insert, such as plywood. Made of steel and is rust resistant. the shape of the dog cage is in a “Y” with crossbars. Features wheels that rotate 360 degrees. There are 3 latch locks on front door. Two large plastic trays make clean up easy. With similar features to the LUCKUP, you get all that is prized among heavy-duty crates. This brand is known for its unique crossbar design that makes chewing difficult. But, we noticed that the bars are hollow, which some large dogs might be able to chew through after some effort. This crate comes with 2 large plastic trays for easy cleanup and 4 rotating wheels that lock into place for convenient mobility. For the high price, this crate has plenty of high-quality features, and it looks tough, but the construction doesn’t seem up to par compared to other crates of comparable price due to hollow bars and weaker welding. Made from 20-gauge steel and reinforced by 1/2″ diameter steel tubes. There are 4 removable locking casters. 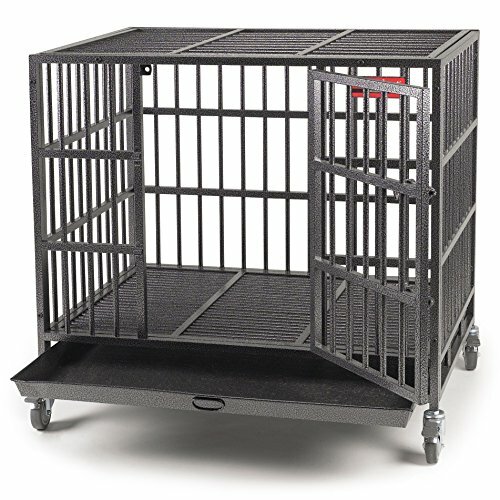 For the price, this heavy duty cage has all of the bells and whistles you would want for convenience, from the removable clean-up pan underneath to the attachable wheels on the bottom corners for effortless mobility. It may have what the other heavy duty crates have as well, but it really lives up to the reputation for being trustworthy and strong. This is something rare to find even amongst crates classified as such. It’s more expensive, but you get what you pay for. Dogs are always surprising us. We love them, but they can drive us crazy. This especially holds true when it comes to staying put in a crate. Some dogs are angels in a crate. But others, well, we don’t know what goes through their heads! They possess superpowers and some sort of ancient black doggie magic that enables them to escape from the most heavy-duty crates known to man. You might have a Houdini hound on your hands, and it’s easy to feel like giving up after spending wads of cash on crates and coming home to destroyed furniture and a loose dog on more than one occasion. But, it’s not time to despair yet. Remember that there are tactics you can utilize to learn your dog’s behavior, such as why she is breaking out and how she does it. Then, you can make changes to your crate plan, whether it’s by moving it to a new location, giving your dog exercise before going in or picking certain features for your crate that correspond with your dog’s needs. We loved the LUCKUP Heavy Duty Dog Cage because of the amazing price for all of the features it offered. The designers touched on every aspect of what makes a crate heavy duty, from the durable metal frame to the multiple door access, 3 locks for extra security and easy-to-clean removable pans. Overall, it comes down to your dog and the time and money you are willing to spend. Remember, it’s not just peace of mind for you, but also for your furry best friend. Some great products with some fair reviews. Although the Diamond Deluxe is a little bit scary for my taste!